Sherri Steeneck presides over her first meeting as acting first selectman Wednesday. Fairfield's selectmen -- only two of the three officials now remain in office -- found themselves in uncharted waters Wednesday, and by the tone of the discussion, its appears their choice of an interim first selectman will be smooth sailing. With the resignation of Kenneth Flatto as first selectman on Tuesday, the town charter gives the job of appointing his successor to acting First Selectman Sherri Steeneck, a Democrat like Flatto, and Selectman James Walsh, a Republican. The interim first selectman, who will serve as the town's top official until the November municipal election, must be a Democrat as is Flatto. Flatto left the office to accept appoint by Gov. Dannel Malloy as the state's director of special revenue. The two selectmen have 30 days to come to an agreement on an interim first selectman before the choice gets kicked to a vote by all of the town's elected Democratic office holders. 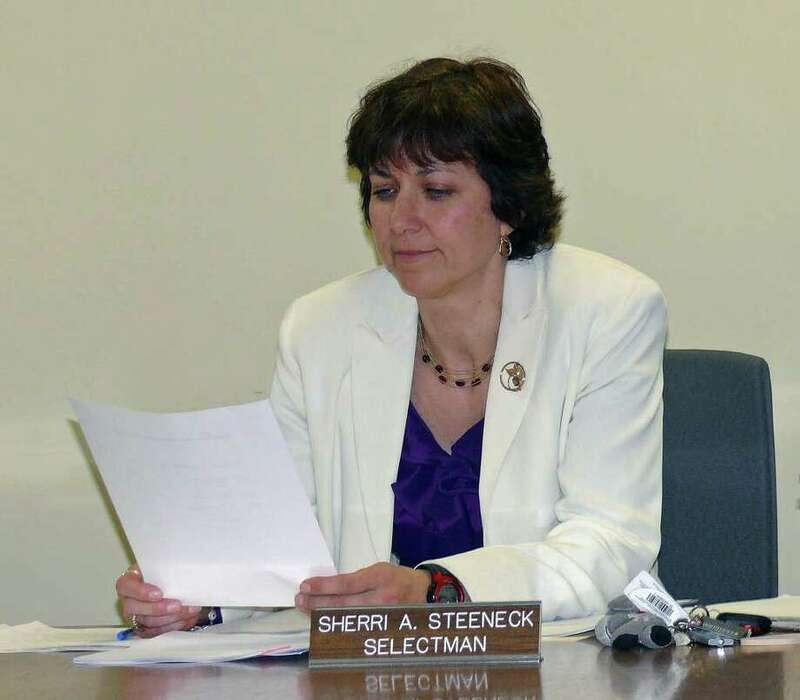 Steeneck and Walsh began their discussion about choosing an interim first selectman this week's Board of Selectmen meeting, but no vote was taken. Steeneck earlier Wednesday was sworn in as acting first selectman at a small ceremony in her temporary office, with her mother Beatrice in attendance. The Democratic Town Committee has endorsed for the interim post Board of Finance member Michael Tetreau, who is planning to run for the office in November. "My answer to anybody but Mike is `no,' " Steeneck said at the afternoon meeting, "because that's who my party put forward." She said the Democrats followed the process for filling the vacant first selectman's job, adding that whoever is the interim official must be accountable to the town's taxpayers, something that might not happen if that person were simply a placeholder, which is what Walsh advocated for. "A placeholder would not really have any political influence," Walsh said and could run the town without having to consider how decisions might affect their electoral chances in November. He also said when Flatto discussed Walsh's appointment to the Board of Selectmen, he asked if Walsh was considering a run for the first selectman's seat. Both Walsh and Steeneck have been appointed to the board to fill vacancies caused by the deaths of their predecessors. Walsh also argued that Flatto often deviated from appointing the Republican Town Committee's recommendation for seats on boards and commissions. "Many times I get here and I'm finding out about a new appointment and he's got a Republican name I've never heard of," he said. He also acknowledged that serving as interim first selectman could be a double-edged sword for a future candidate, because that official could make a misstep along the way. "We could go 30 days and Mr. Tetreau will be sitting between us and there's nothing I can do about it," Walsh said. "Just because you're going to hold a gun to my head doesn't mean I should do it." Steeneck said she had no gun in her hand. "We can talk about Ken and the process, and I think we would probably agree on every point," she said. "With all due respect to Ken, that was probably my biggest gripe ... I'm hoping we're going to go into a period where we have a little more transparency." Walsh made some alternative suggestions for the interim first selectman, including Thomas Bremer, who served for the last five years as Flatto's chief of staff. "He's worked on every major transaction that's come through the first selectman's office," he said, and would be able to step into the position "without losing a heartbeat. He could start tomorrow." Other names mentioned by Walsh included former state Rep. Susan Barrett, former Board of Finance member Kay Doyle, Stanton Lesser, who was once on the Board of Selectmen, and Walter Flynn. "All of those people are members of the Democratic Town Committee," Steeneck said, which was unanimous in its support of Tetreau. None of those names, she said, including Bremer's, was ever brought forward. Walsh asked that the issue of naming an interim first selectman be put on the agenda for the May 18 Board of Selectmen meeting.